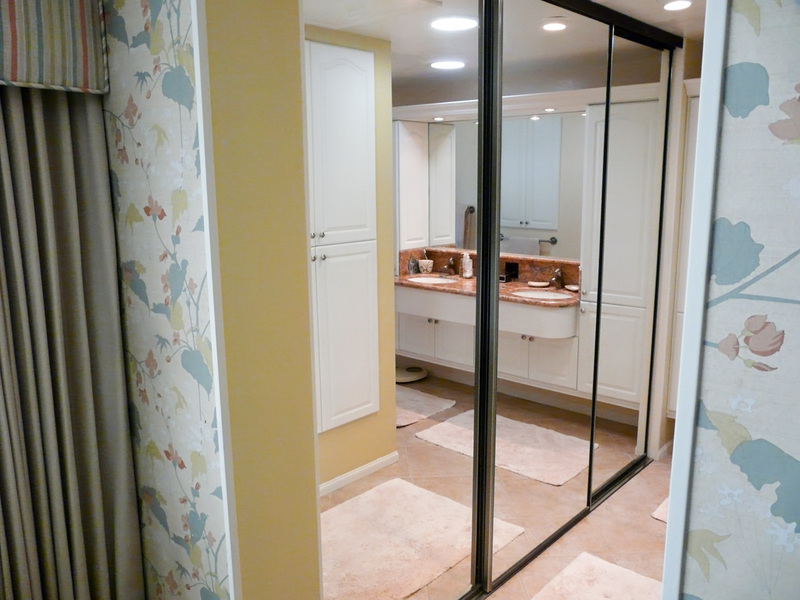 This was the second major project we did for this Bonita Family. 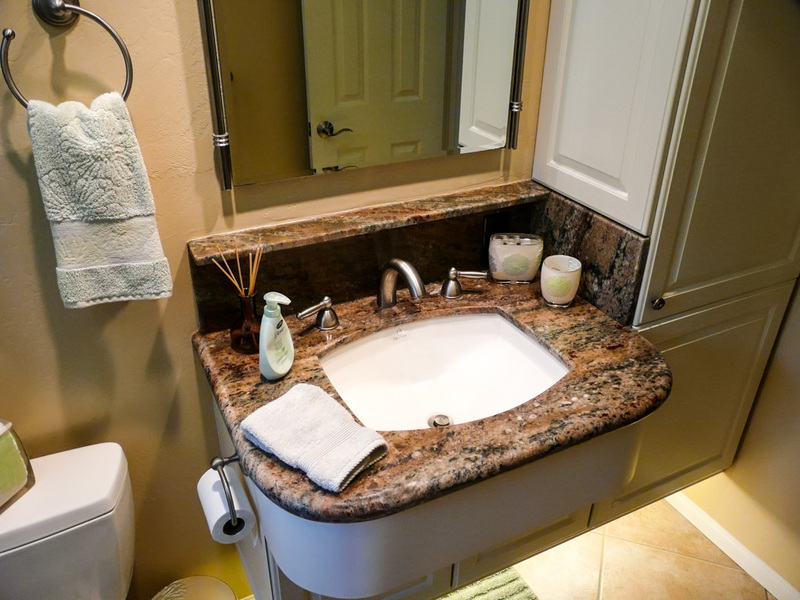 This project included 3 bathrooms, and a laundry room remodel. 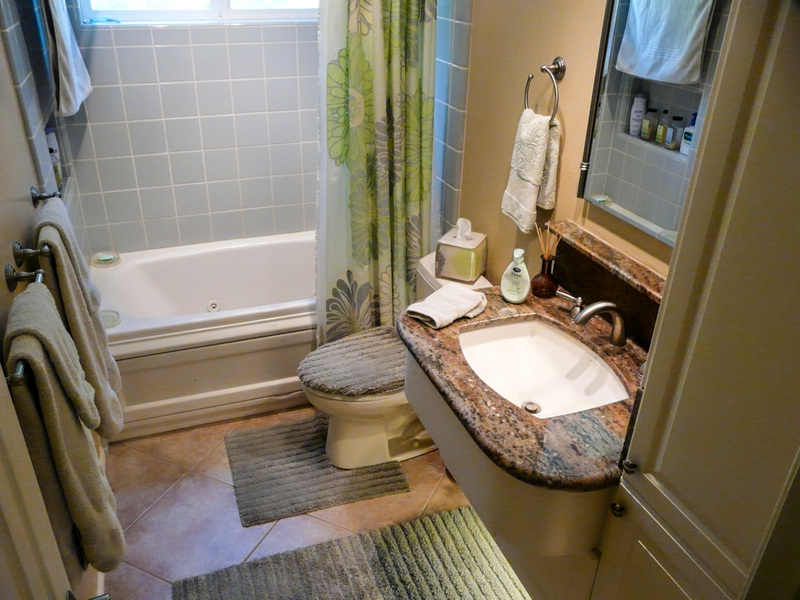 The Master Bath was done first, then the other two baths and laundry room were done concurrently. 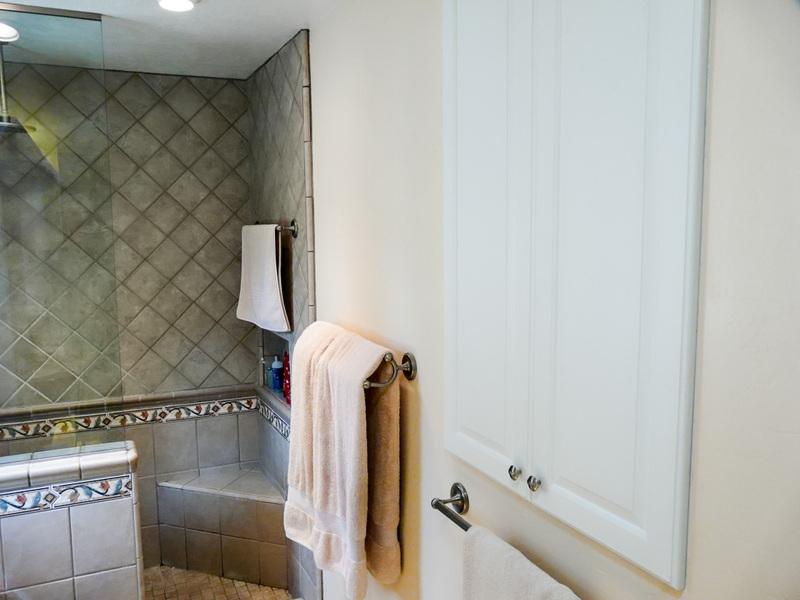 Two of the baths and the laundry kept the same “classic white painted cabinet” look we used in the kitchen for their first remodel. Like the majority of my clients who originally requested this white painted look, as you will see in my portfolio, when I showed them samples of white raised panel thermofoil doors and explained how easy they are to keep clean, how they last many years longer than a painted door, and how much less expensive they are, they selected the thermofoil. 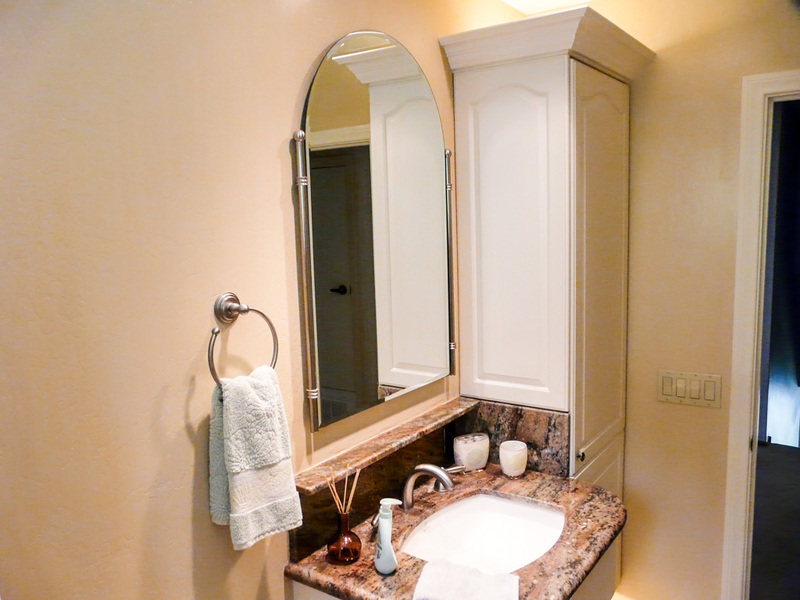 Unlike most other cabinet fabricators, I do not limit the molding options for a thermofoil cabinet project like this to only thermofoil light valence or crown moldings, since they are very limited in size, shape, and color. When I say these doors look like painted doors, I am not exaggerating. What I have always done with solid color thermofoils like this is offer all the same molding that we use on real wood projects, and simply paint the wood to match the thermofoil. This has always given my thermofoil projects much greater depth and detail than other manufactures, who do not seem as capable of thinking outside the box and mixing materials to create unique and stunning detailed overall looks that can be shaped to any style, by the use of appropriate detailed moldings. Classic, Mission, Craftsmen, Art Deco, and most other styles are not defined as much by the actual door style used as they are by the choice of how to accent the doors with accompanying crown, casing, or light valence molding that create the overall style. 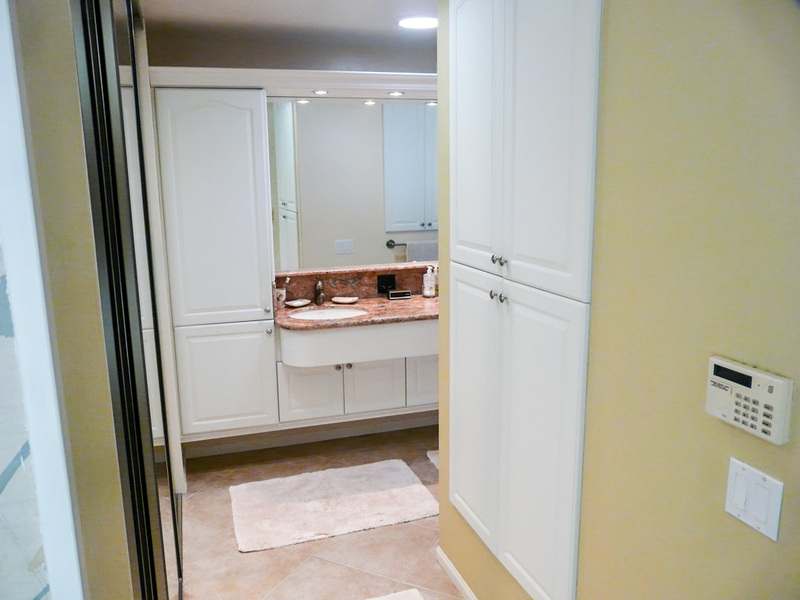 Adding as much storage as possible and upgrading the baths were the clients primary concerns. 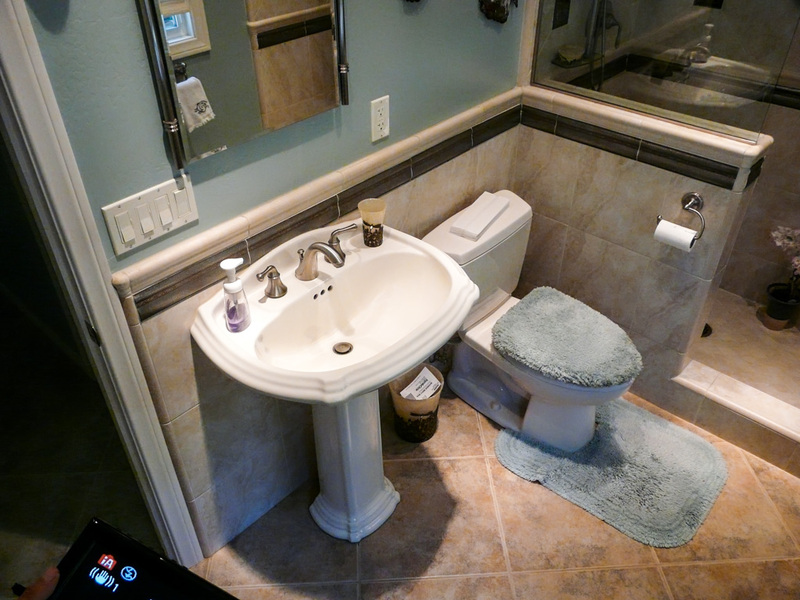 Because of this, they decided to use what I call my Euro Bath Storage configuration for master bath and also the upstairs hall bath. 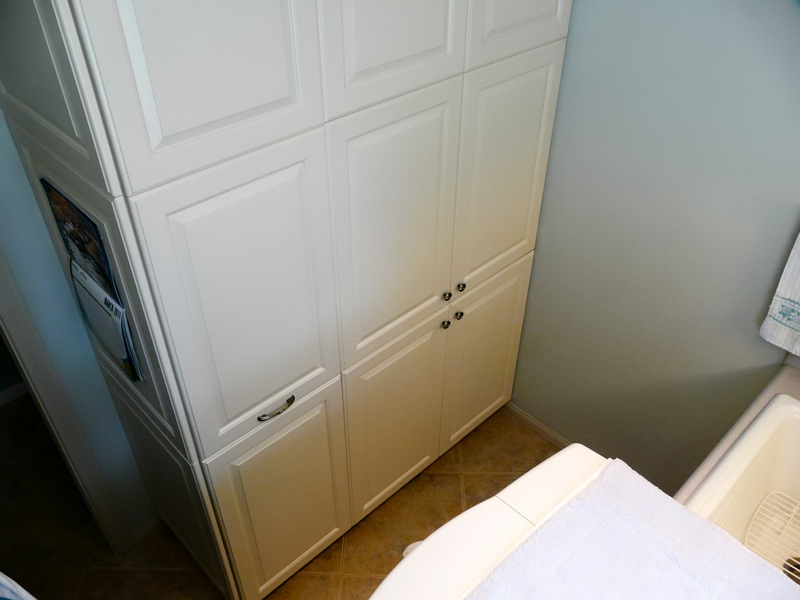 This Euro Bath cabinet solution incorporates shallow pantry-like storage to each side of the sinks in this master that has two sinks. Creating a his and hers sink and storage area where all the things they use every day, multiple times a day are behind doors on those shelves within reach as they stand in front of the sink to groom, including electrical devices that are constantly plugged in to the 4 outlets inside each cabinet. 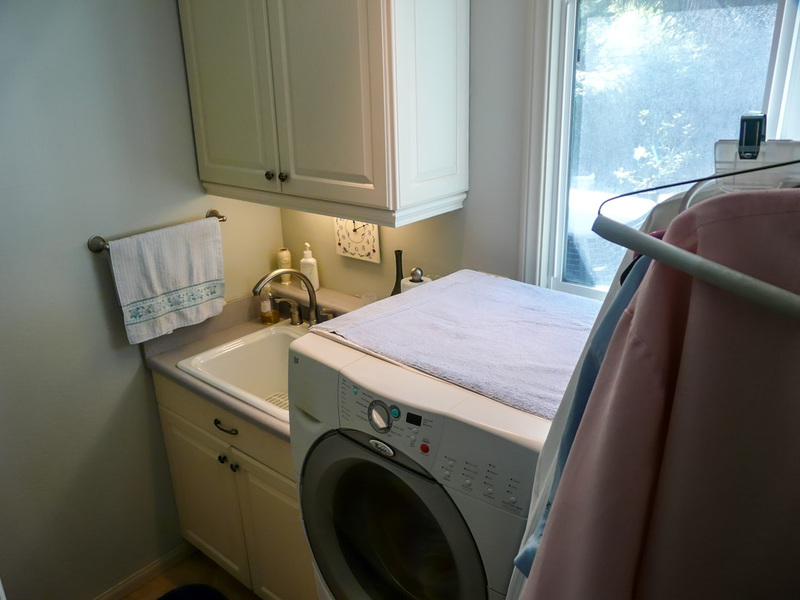 When they are at the sink, they leave the door open for access to those implements until they are done and easily put away. 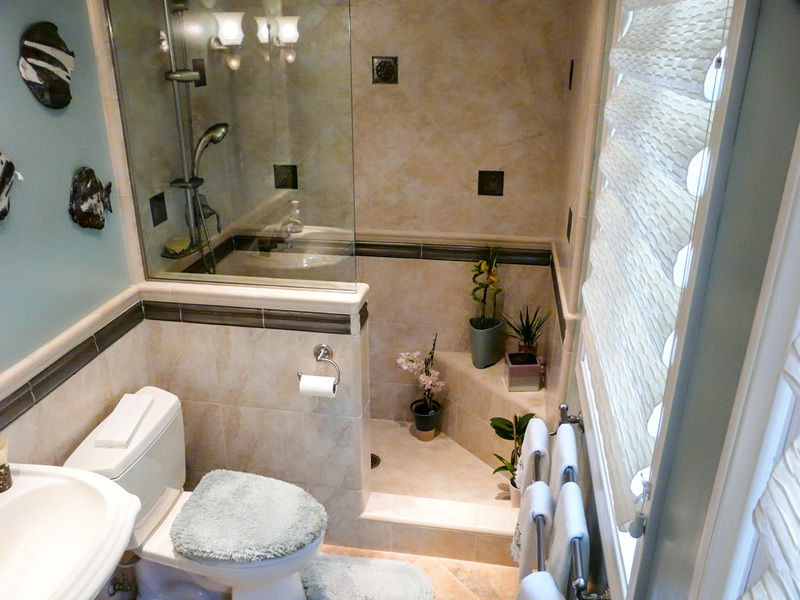 When they close the door and walk away, the bath is as clean as when they first walked in. 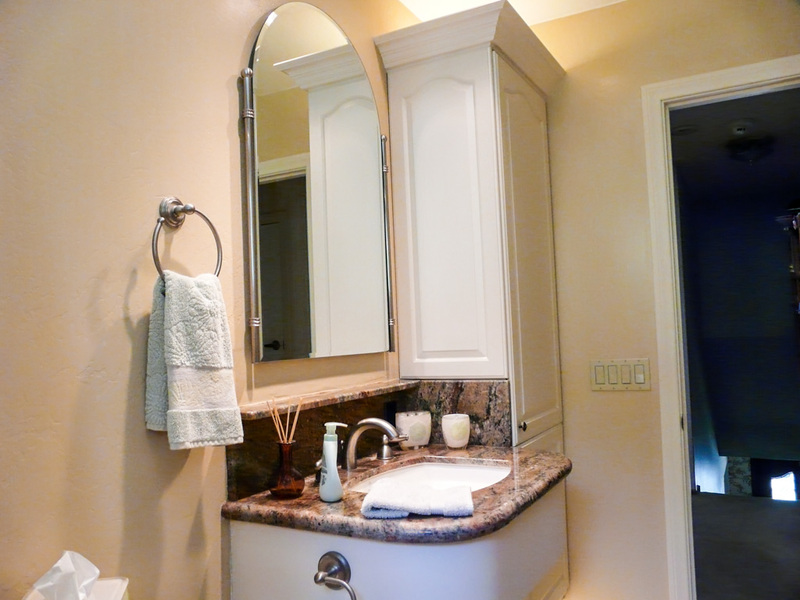 Can you say that about your typical American bath with just base cabinets and a countertop? 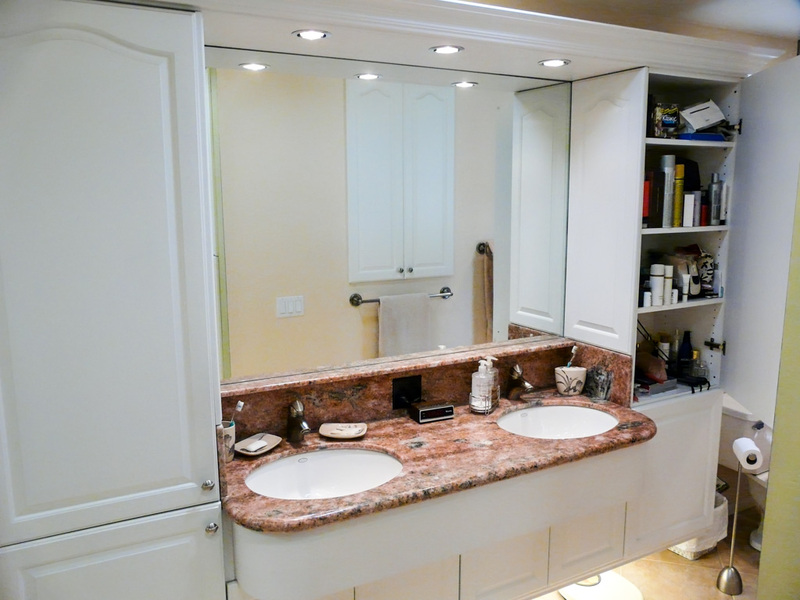 That application give any bathroom more volume of easily accessible storage than any other possible configuration. 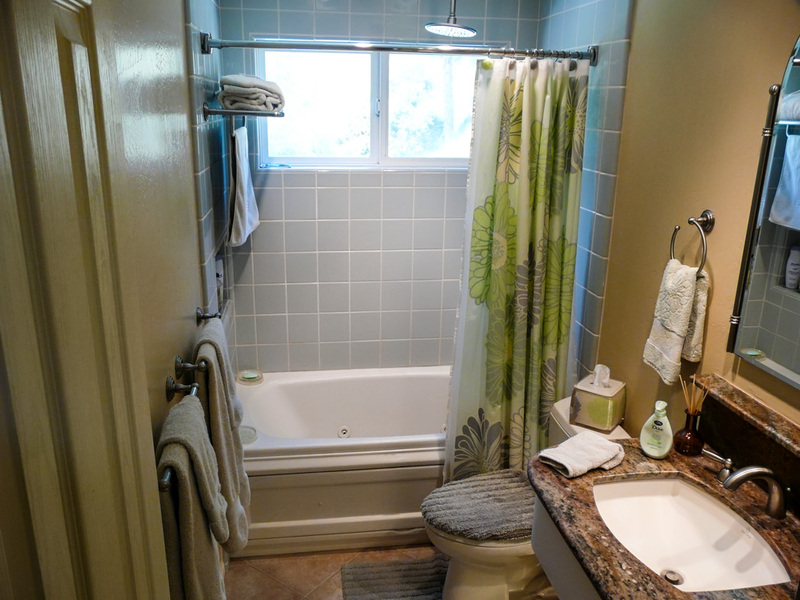 It is a very different look than a traditional American bath that just has 21″ deep base cabinets and a countertop, but it is far more functional and it does not protrude out into the room as far. 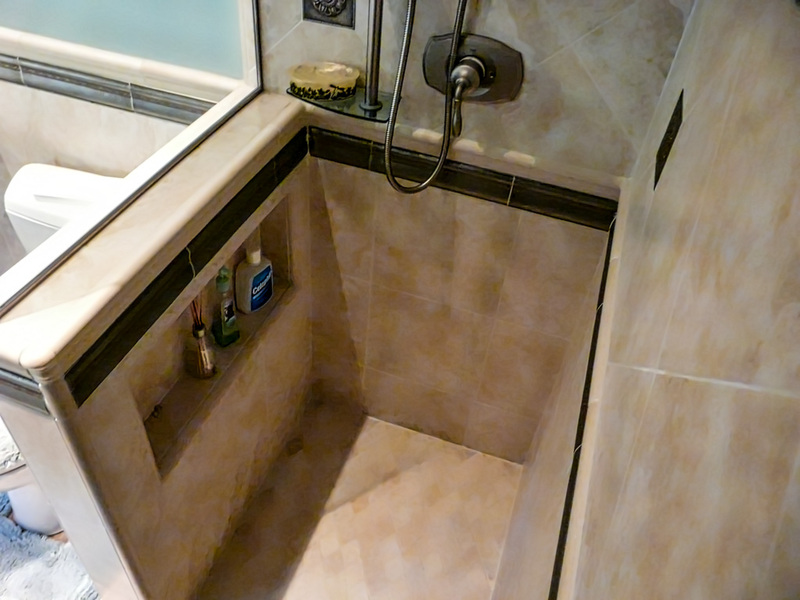 This leaves far more available floor space that is welcome in most small or narrow baths like this one, particularly when two people are in there at the same time. 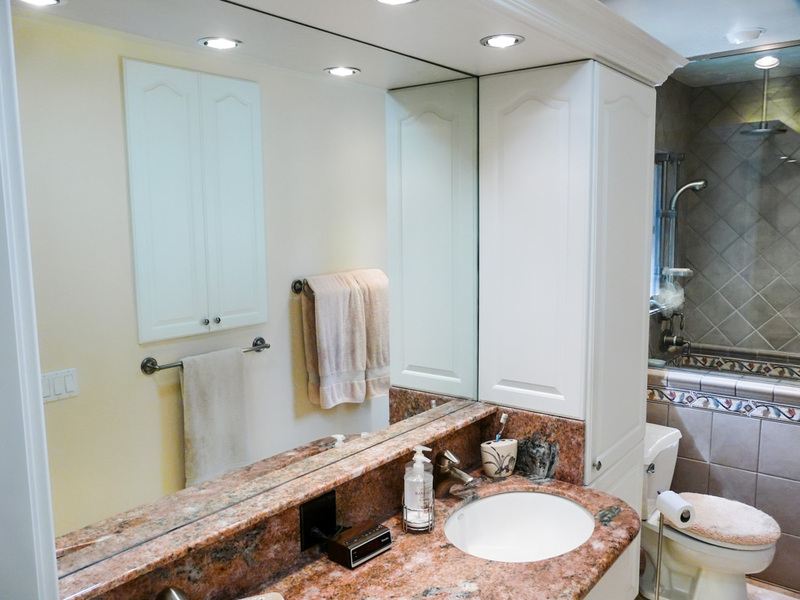 This Euro style using pantry-like cabinets is not the only way to create storage that meets my functional bath criteria — if you look at other baths in my portfolio you will see it can also be done with wall cabinets to either side of each sink or medicine cabinets. 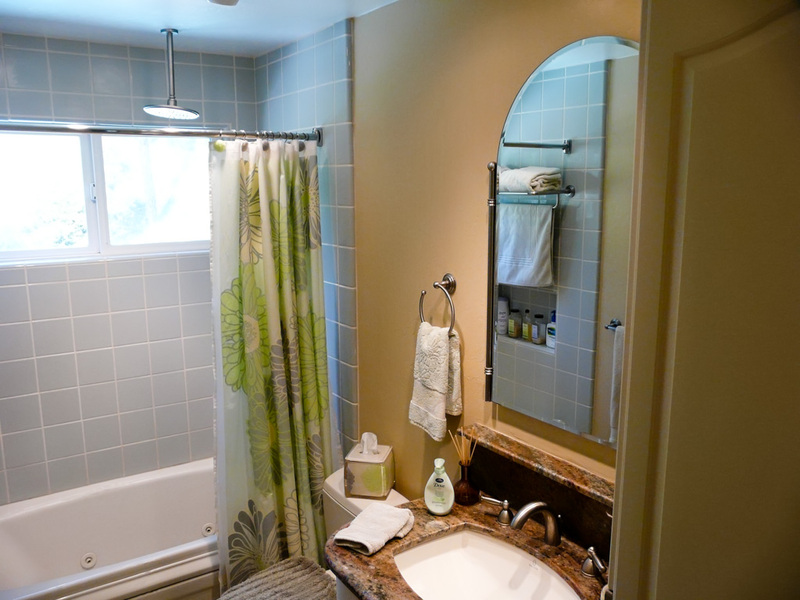 The shape and size of each bath, combined with the owners style choices, will dictate the best application of the functional bath concepts for any client. It is a reality no matter how large or small our homes are. 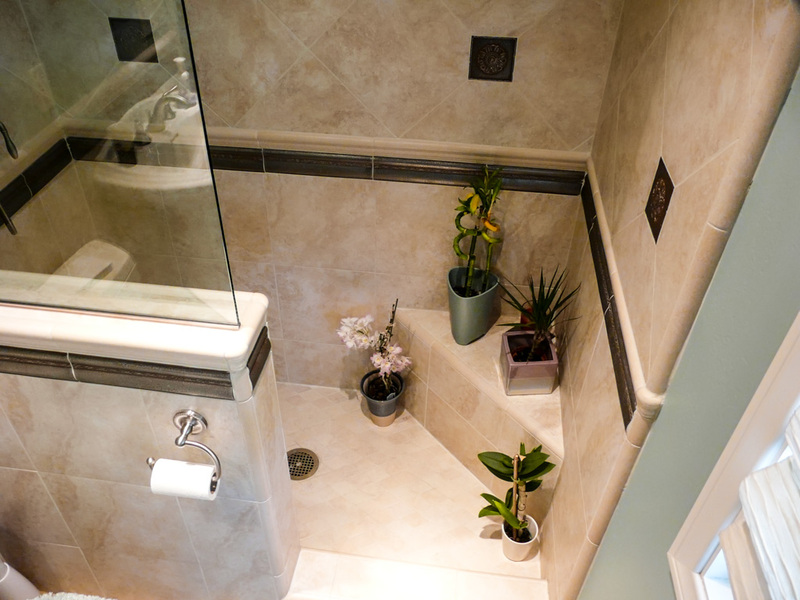 To get even more storage for this client, we cut into two unused walls to access dead space in this home created by the stairs leading to the second floor and this master bath. 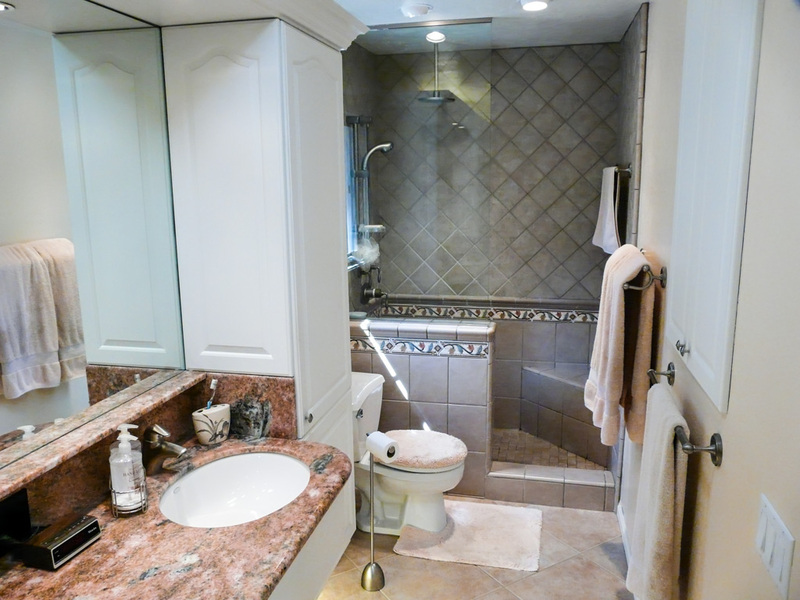 As you enter the bath from the bedroom, you will see a cluster of 4 doors much like a pantry on the right. 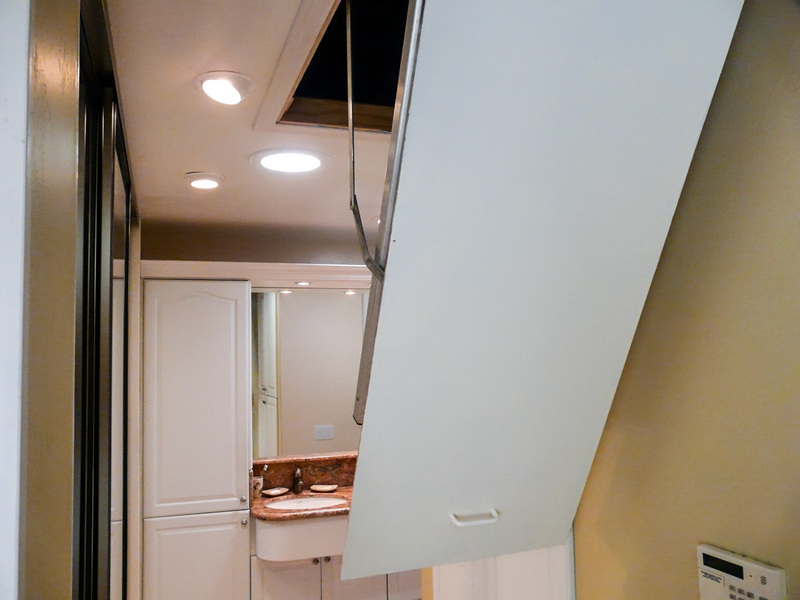 If you were to look inside, you would see shallow shelves at the bottom that grow in depth to 24″ deep from the middle up, following the contour of the ceiling above the stairs. 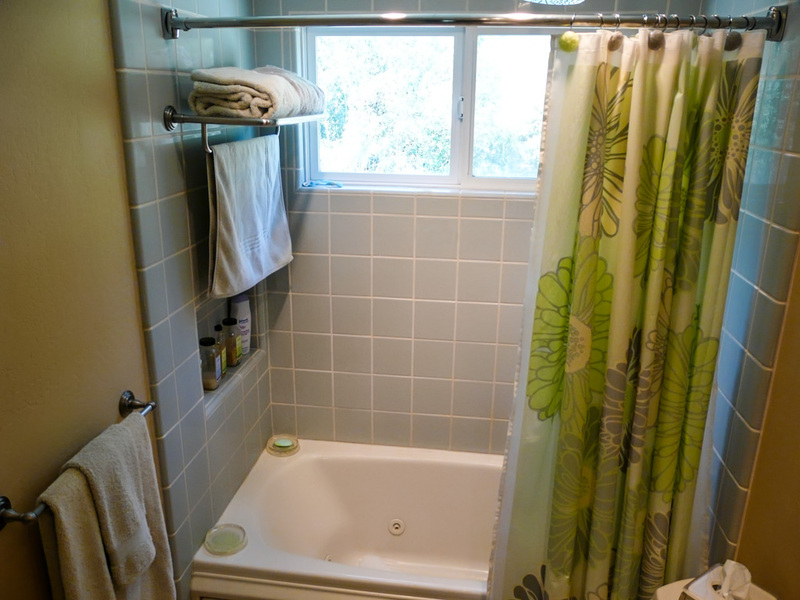 When you turn the corner into the bath, you will see two more doors up 48″ off the floor that are 36″ deep inside. 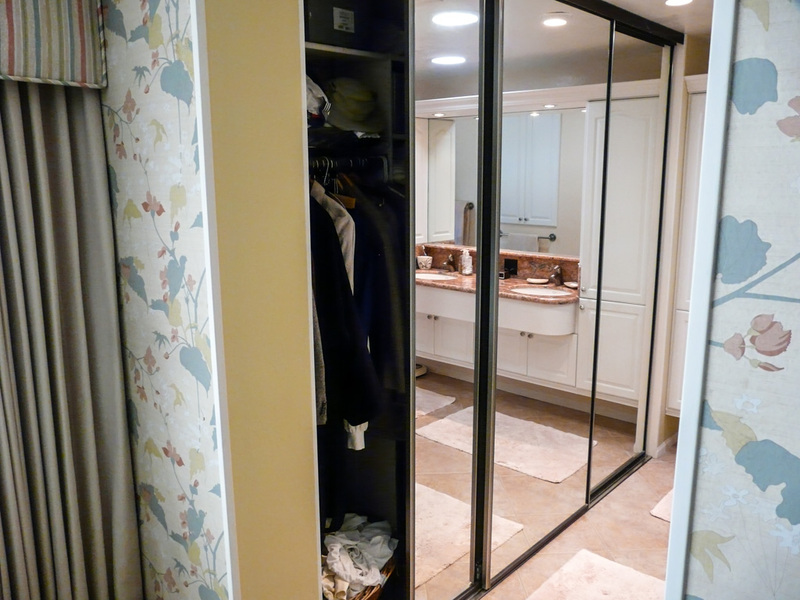 This captured space adding an enormous amount of storage for this client. 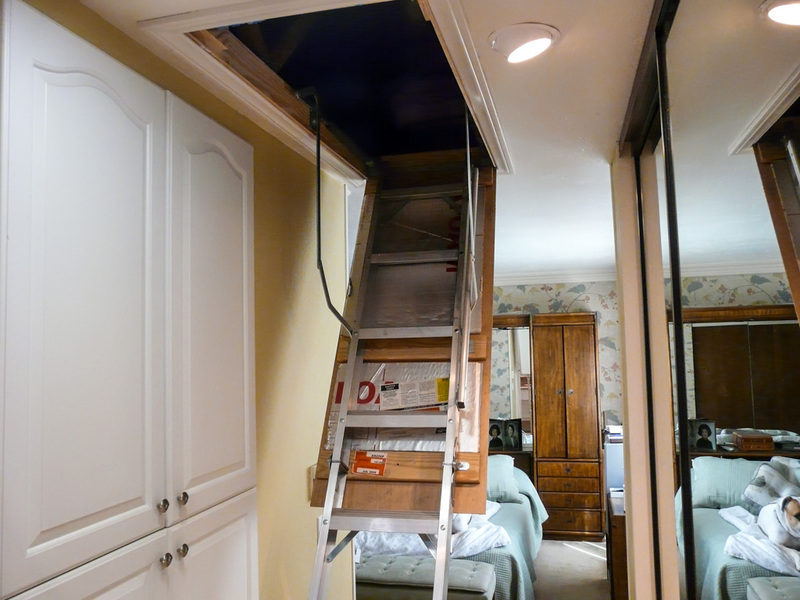 We also added a pull-down attic ladder and lined a large part of the attic with plywood flooring for long term storage. 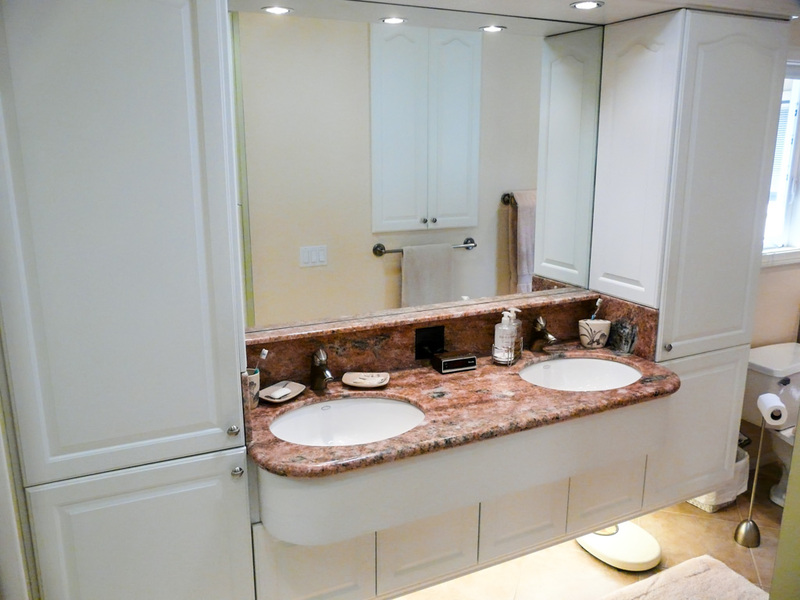 I often use over and under cabinet lights in this Euro style cabinet configuration for soft indirect lighting that often is all that is needed when using the bath. 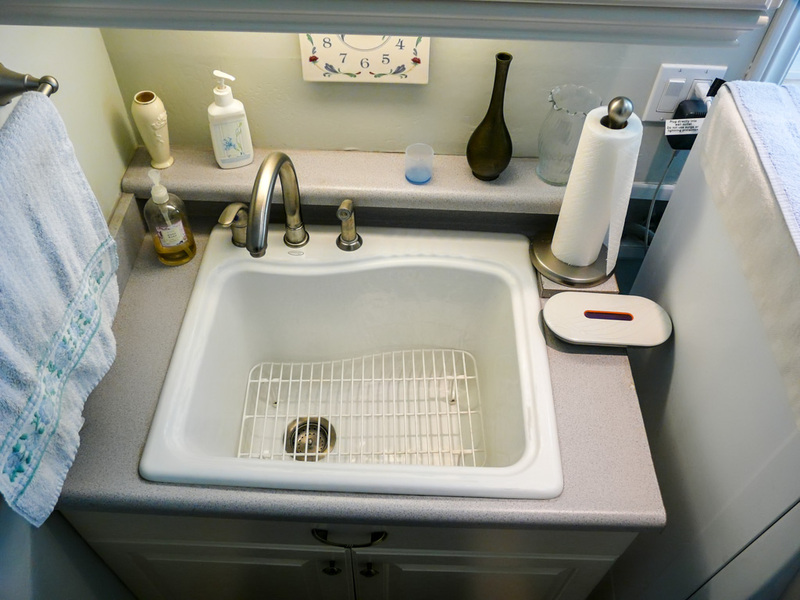 I also regularly use mini cans in a valence above the sinks in this cabinet configuration for more focused light directly over the sinks. 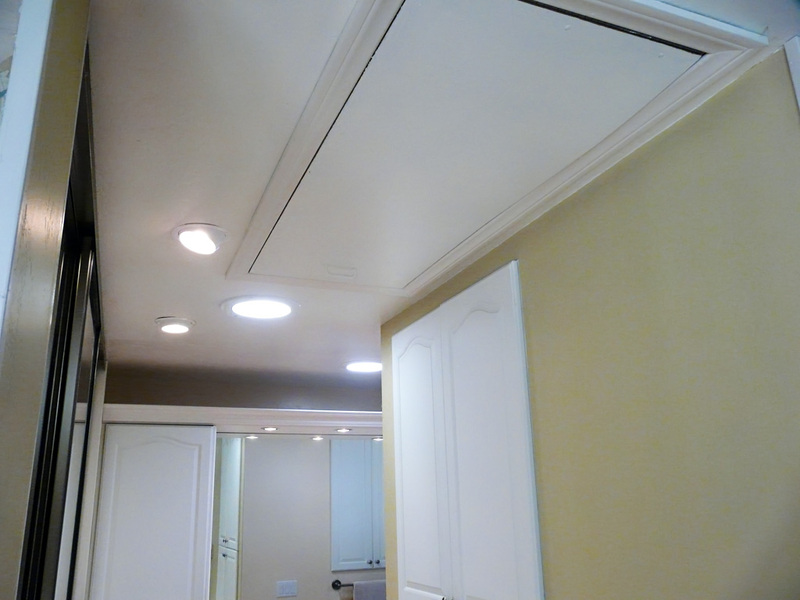 We added two Solatubes to bring in more natural light during the day. 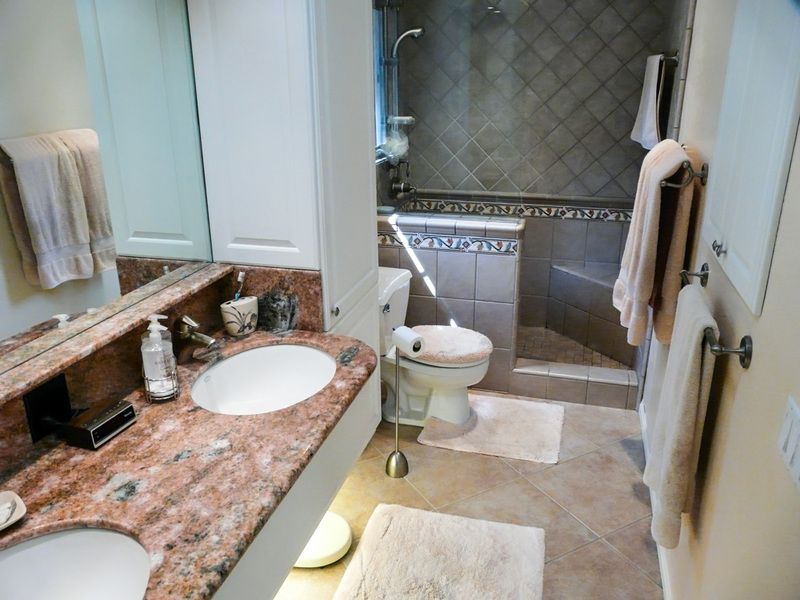 The lighting in this bath was completed with the use of recessed halogen ceiling can lights placed where light was needed, not in the middle of the room. This job was done before LED cans were available, so the cans that service the showers in all the baths are eyeball (directional) cans that point into the shower because all the shower rated cans available in that time frame that you could put inside the shower, simply did not work; they put out less light than a night light but consumed as much electricity as a standard ceiling can. They were so bad most clients never ever bothered to replace the bulbs when they went out. 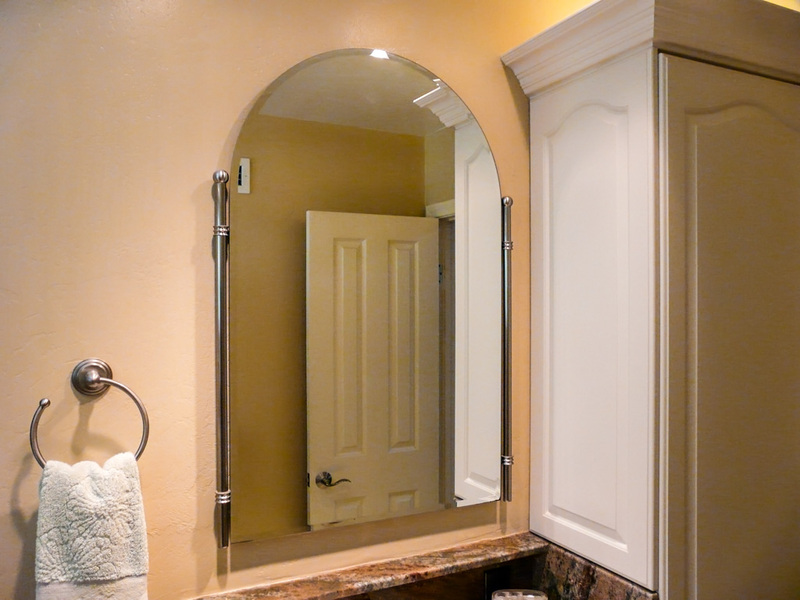 Today, LED recessed ceiling cans should be used directly over all showers or tubs since they put out terrific light and are water proof and rated for use in those locations. 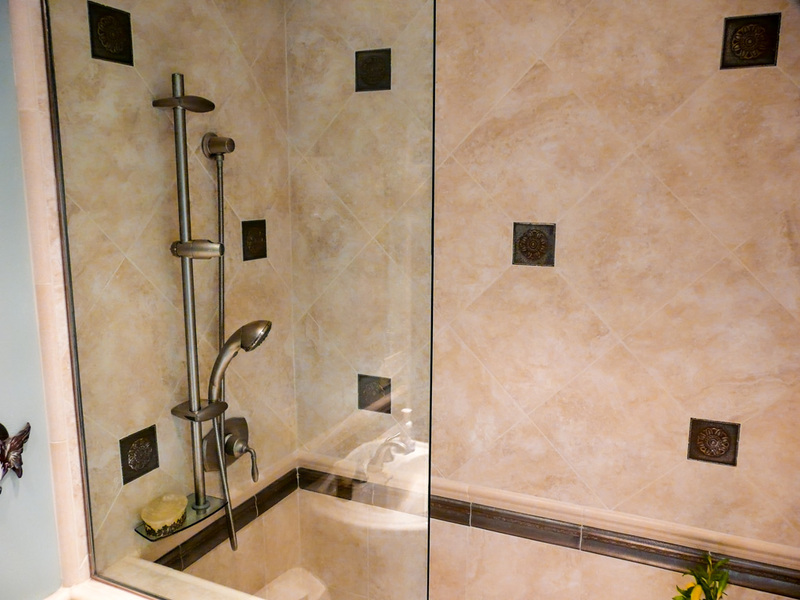 The master shower and powder room/pool bath have similar functional shower systems with no doors. 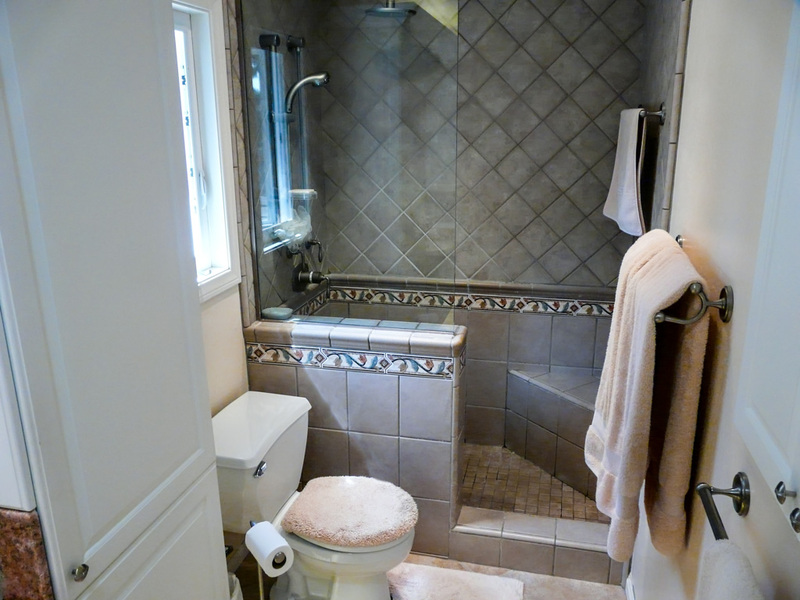 Users can simply walk in, shower, and walk out when done. 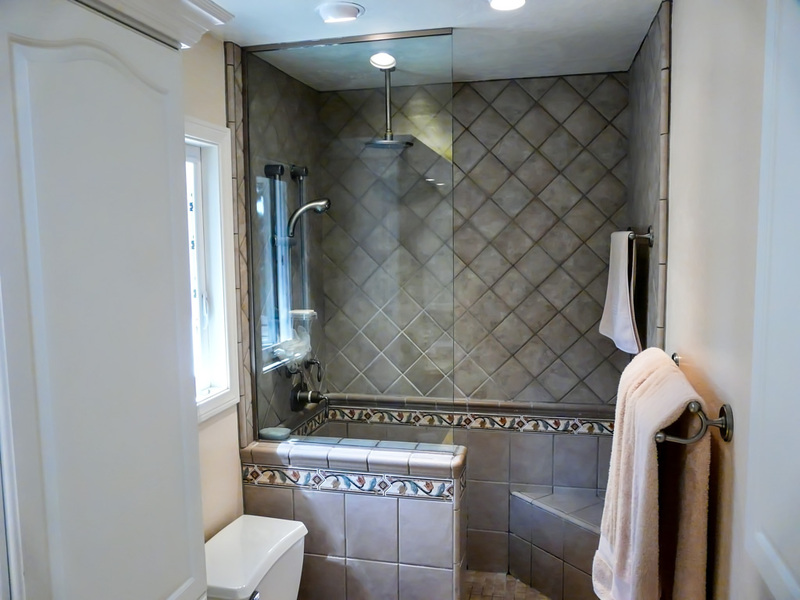 Tile was installed up to the ceilings in a style and design to the client’s needs. 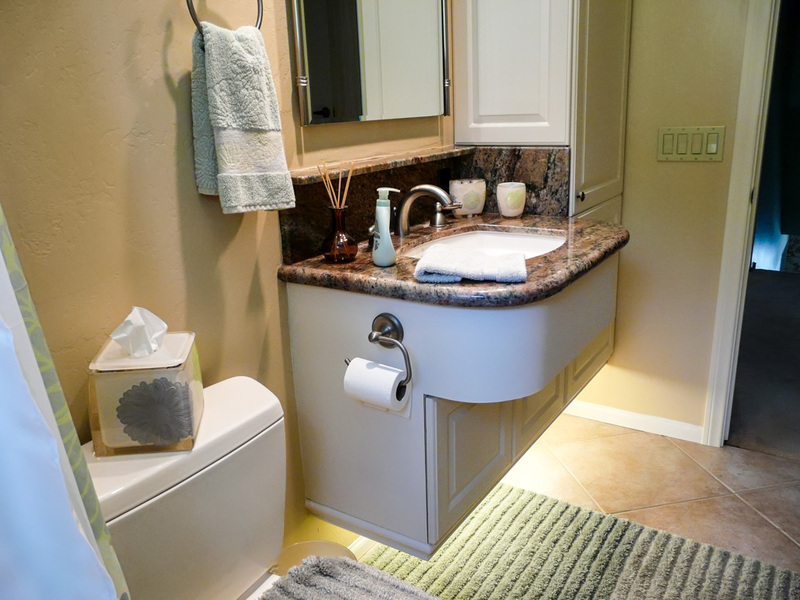 Read my Functional Bath Design pages to learn more about the how and why these baths meet those functional bath principles. 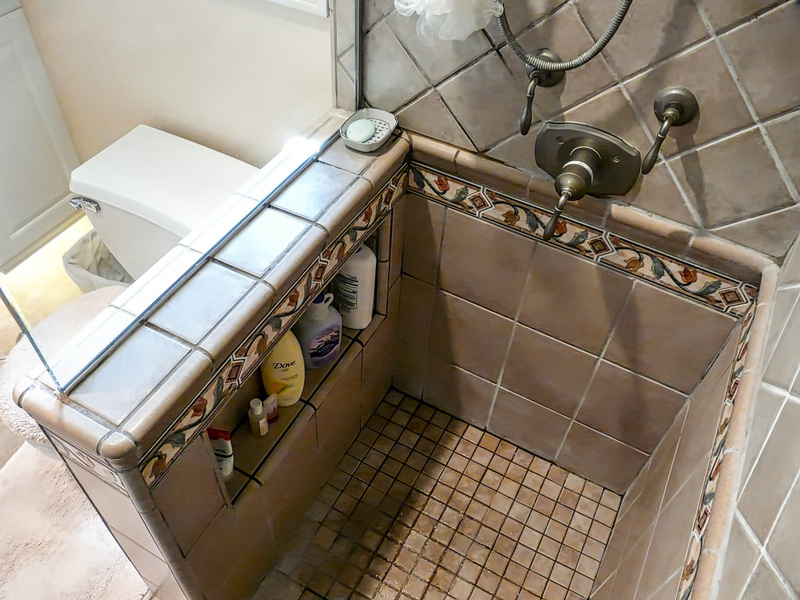 Venting was upgraded in all three baths and the laundry room, but this client decided not to add an on-demand heater that is essential in many small baths. 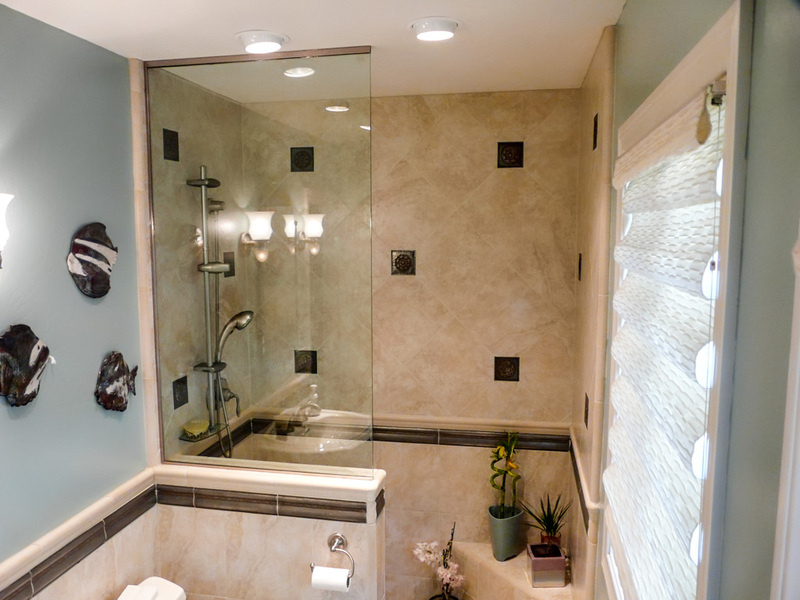 They had good reasoning: the master bath, where most of the showering is done, is an open air space to the master bedroom, so it has abundant air volume. 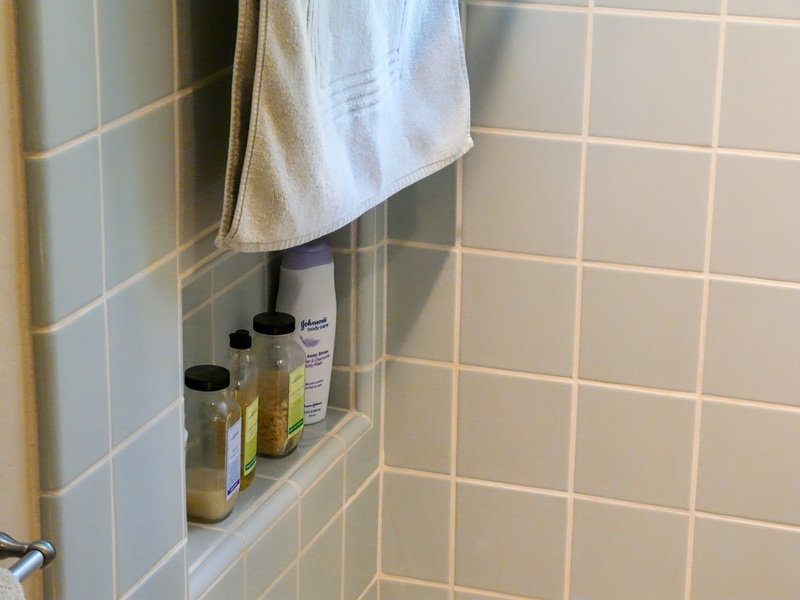 In their use of this bath for over 30 years, they never noticed any of the typical symptoms of the air becoming super saturated, such as mirrors fogging over or mildew build up. 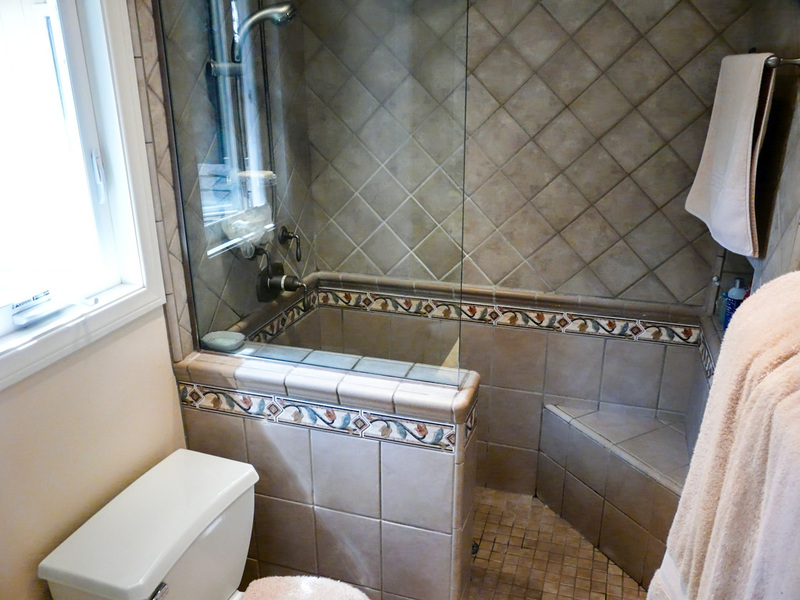 The hall bath is used primarily for the tub, the whirlpool jets for the owner and the tub when they are taking care and bathing very young grand kids. 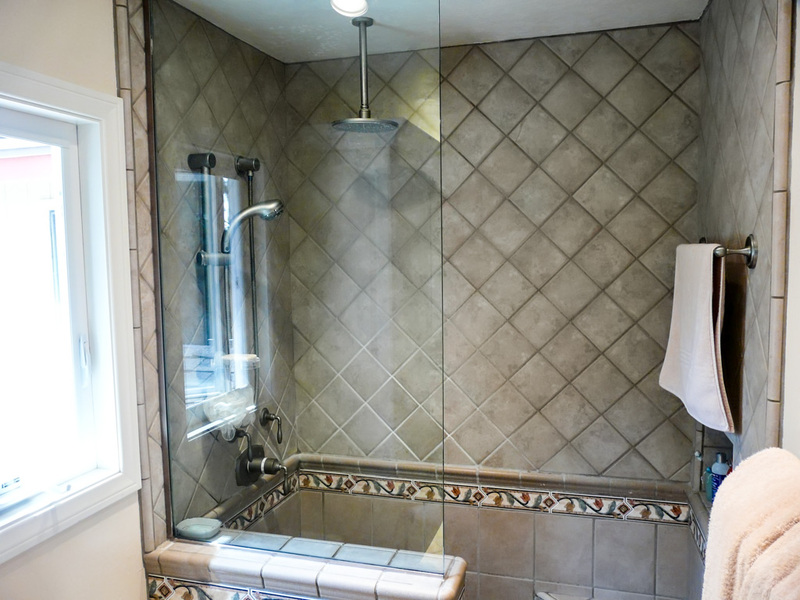 In the pool bath, the shower is only really used to rinse off the chlorine from the pool. 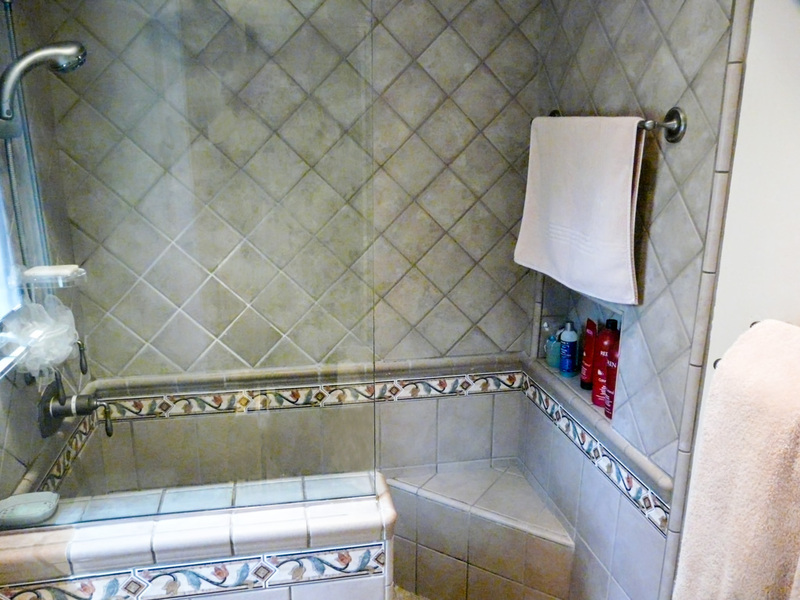 Extended showers are never done there, so the vents seemed to be all they needed. 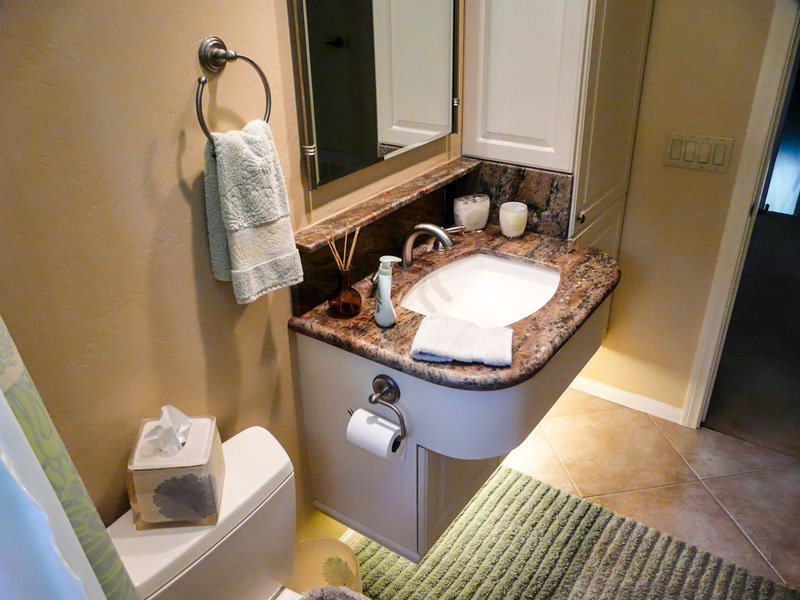 The hall bath is a smaller one-sink version of the master bath with the new whirlpool jetted tub. 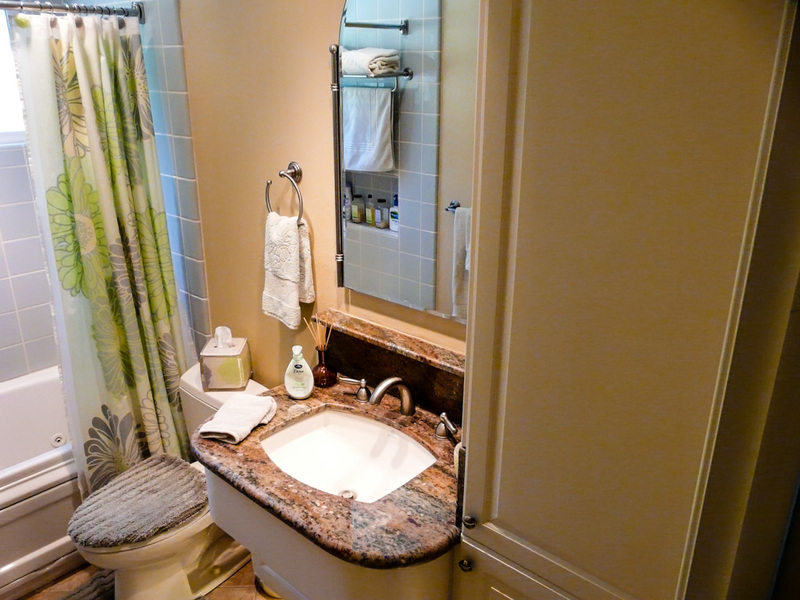 The powder room pool bath was upgraded for looks, not storage. 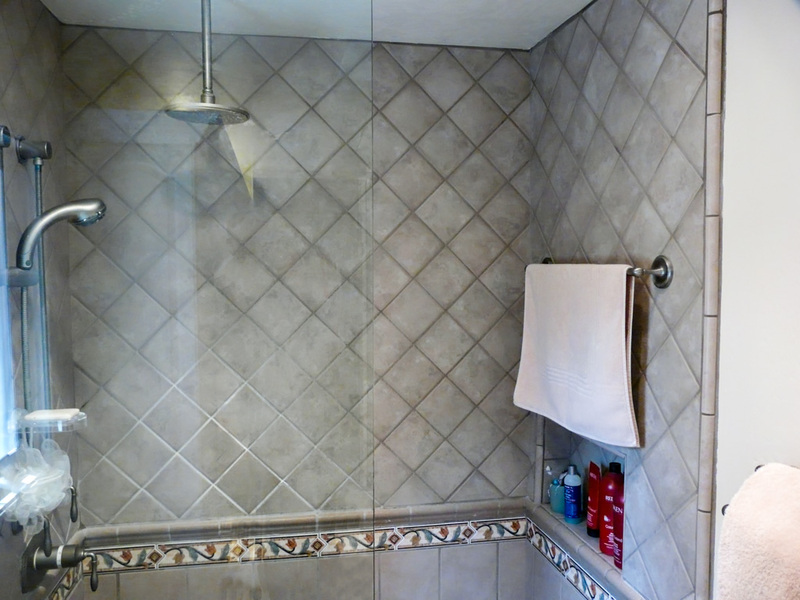 Tile wainscot covering was put halfway up the wall behind the pedestal and toilet and to the ceiling in the shower. 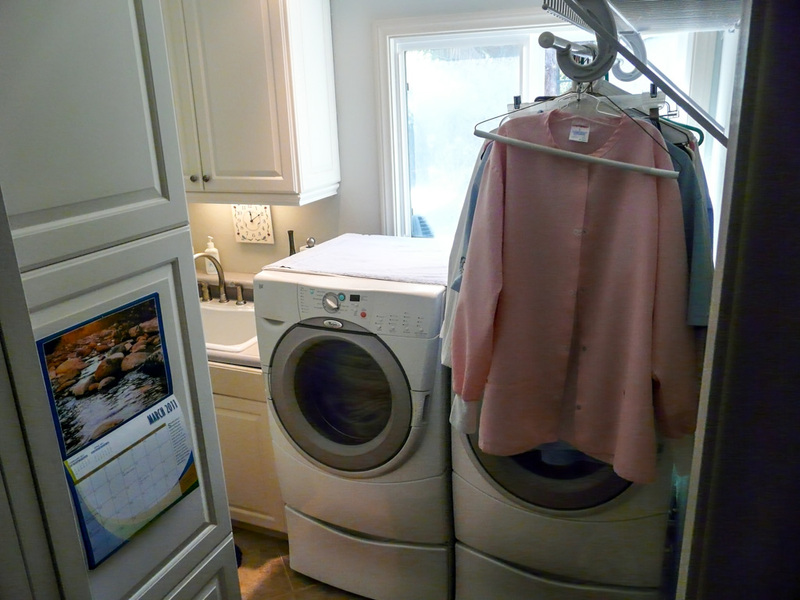 The laundry room continued this client’s emphasis on storage, packing as much as we could into the small room with pantry and pull outs to make it easier access. 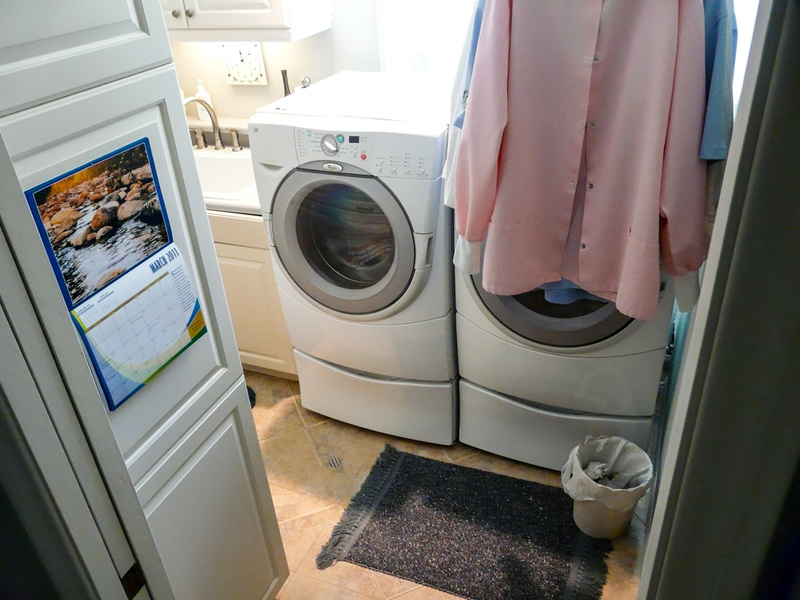 One detail of note in that laundry is the floor drain. 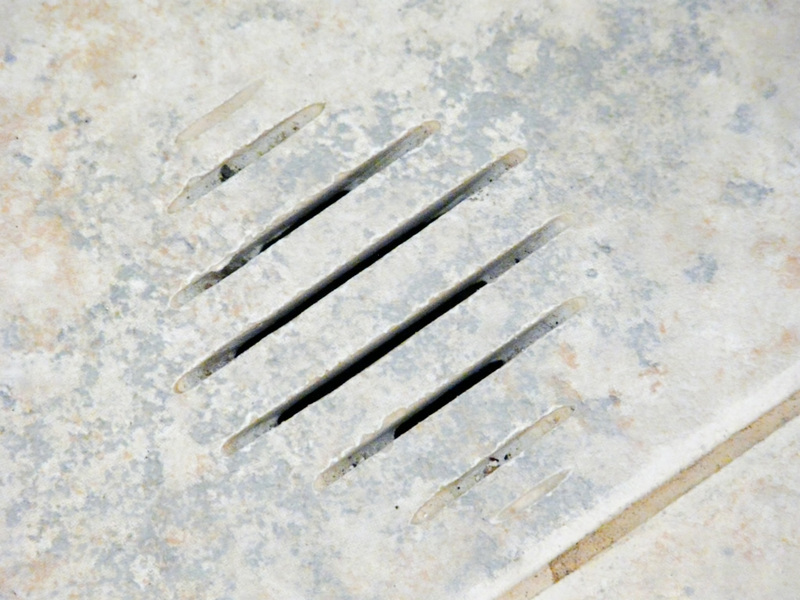 The drain was original in the home, but the way we hid it was not. 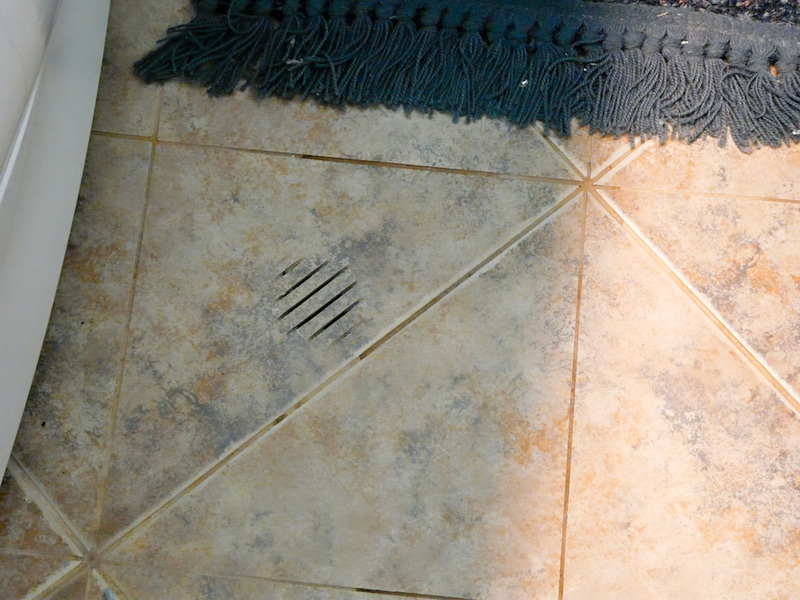 See the custom tile work done to hide it while keeping it fully functional. 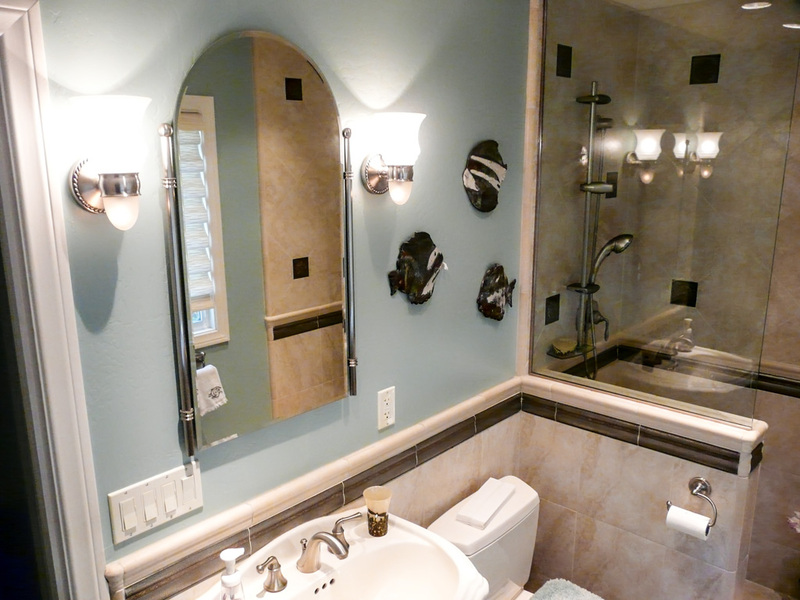 We have since helped this client with some other minor work to make their home more functional and update its original fixtures and materials. It is ready for them to enjoy a more carefree retirement in a few years. 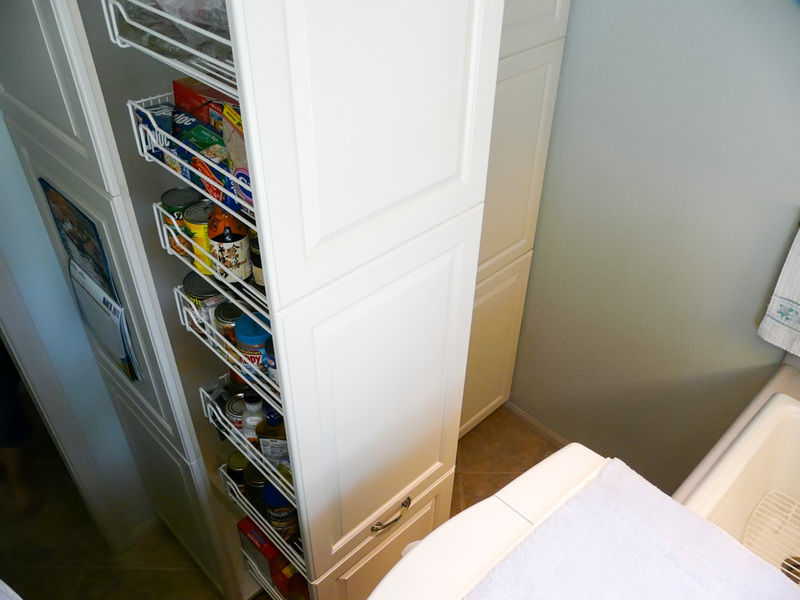 The last thing for them to complete this task is replacing the florescent under cabinet lights with LED versions, as they’ve already begun replacing the Halogen cans with LED lights at the time of writing.